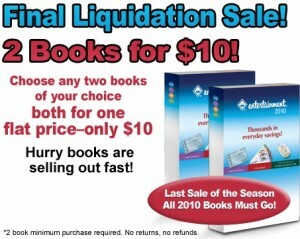 Entertainment Book has a big blowout sale going on right now as they try to get rid of the last of their 2010 book. Right now you can score them for 2 for $10. There is a shipping charge of only $1.00 per book. Reader Laurie informed me that she was able to call after she placed her order and they reversed the shipping charges so you may want to give that a try. As I mentioned before, there are $5 off $50 ShopRite coupons in the book for those of you that shop there. One expires on 7/31 and there is another that expires on 10/31. Plus a lot of of other great coupons. Just an FYI, I buy the Essex book in case you are wondering about which book may have the ShopRite coupon. But I know other books do have it as well but I’m not sure which. And you can shop through Ebates to score 25% cash back and if you are new to Ebates you will also get $5.00 cash back. Dingo Dog Bones: Possible $20 In Coupons – 1st 5,000!